Belize NMS: High pressure influence maintains cool conditions then a slight increase in moisture returns over the area later today. 24-hour forecast: Mostly cloudy and cool with little or no rainfall this morning, then a few showers and periods of light rain occur mostly over the south and coast later this afternoon and tonight. Winds: North at 10-20 knots. Today: Winds: North 10-20 kts. ; seas: Choppy - moderate. ; waves: 3-6 ft.; a few showers and periods of light rain. Tomorrow: Winds: NE'ly 5-15 kts. ; seas: Chopppy. ; waves: 3-5 ft.; a few showers and periods of light rain mostly south. Marine Outlook: Sunday night:- Winds: NE'ly 10-20 kts. ; seas: Choppy - moderate. ; waves: 3-6 ft.; a few showers and periods of rain mostly south. General Outlook: For Sunday and Sunday night is for continuing cloudy and cool conditions with a few showers and periods of rain mostly over southern and coastal areas and the higher elevations inland. Last edited by elbert; 01/18/14 06:29 AM. 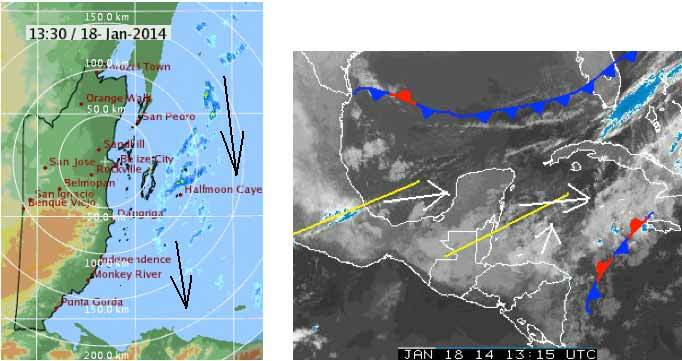 The Northern cold front is still affecting Ambergris Caye this morning. We have an expected high of 78 and it's currently 68. A line of high cloud ( Shown with a Yellow line. ) passed rapidly over us last night and another one moving in. I suspect these are associated with cold air. . .. What ever, they appear to be pushing the Caribbean E wind away, which is diverting up northwards. Looks like it is that, that is causing the rain showers of the coast, which are moving SSE. .. .do not appear to be causing rain on land today. Probably not much sun either today. I keep noticing that the Official Belize Met Office is quoting minimum temperatures well below what I am measuring, and I am wondering why. ? Now I checked my thermometer against a substandard thermometer, ( substandard means calibrated against one of the few Standards around the world. ). I am beginning to suspect that they perhaps do not measure the true Air temperature properly. . .. If you are outside, then things will get colder at night as temperatures radiate up into the sky, particularly clear night skys. . . .. I make very sure that my thermometer only measures the air temperature passing by it, and not influenced by night radiation loss or direct sun rays. Last edited by elbert; 01/18/14 06:28 AM. 19th Jan. On Ambergris caye this morning we have a calm sea and heavy overcast. The expected high is 78.